I've been missing my daily stitching. A lot. I'm eager to come back to this work that I find so meditative. If you would like a stone of your own, I would be happy to put one in your hands. You can decide approximate color and let me know of any particular stitches you'd like, or if you'd like beads included. I will add my own creativity and send a sweet parcel off to you. Each stone has been hand-gathered and felted with wool I've dyed myself. 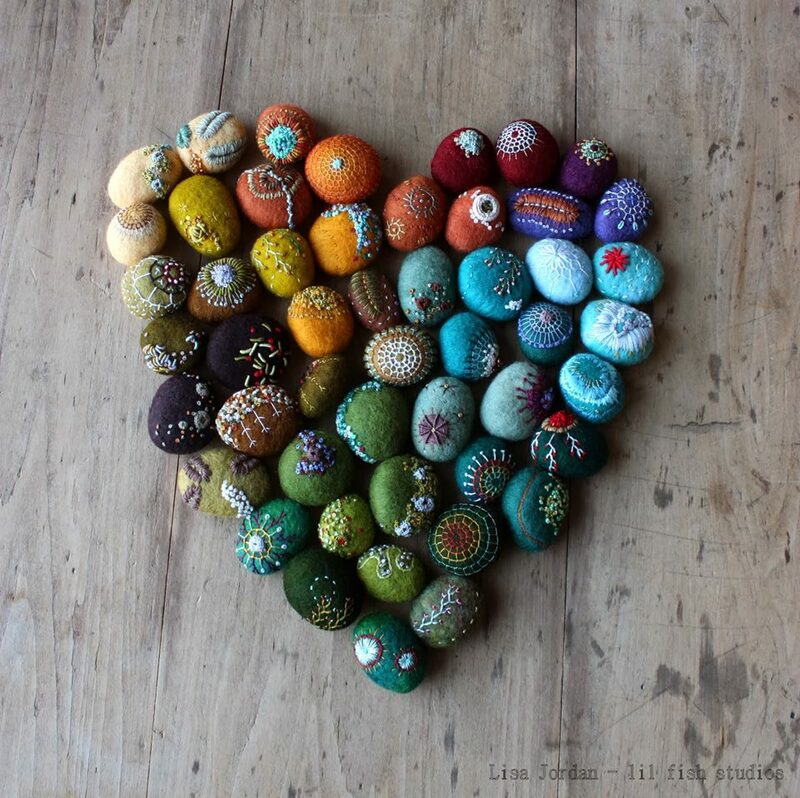 The wool cocoons the stone and becomes a canvas for stitches and beads. The act of creating these stones is soothing, almost healing for me. The finished object becomes something that has a pleasing heft in the hand, and reminds the viewer of patterns and textures found in nature. Each of these stones will be 2.5" - 3" long and fit nicely in the hand. The process of stone-making takes several days - I must felt and dry the stone before I stitch, and stitching may take a week. Because of that, your stone may take several weeks to arrive. I will fill orders on a first come, first served basis beginning in January 2018. I've limited the number of stones I'll make for now, but hope to open up more orders in the future if there is interest. I neglected to link to my online shop. If you are interested, you can find more information here. Hurray!!! I miss your stone-stitching, too. Daily outside work takes a toll on us, spiritually and time-wise. I am feeling the same way, too, and need to find my creative quite spot again. Your stones are always like little gems to me ! Have a "warm" December ! Hooray! It is good to hear from you via the blog. Just yesterday I was admiring one of your stones. I am looking forward to more posts! !